Who needs a Tony anyway? A certain Broadway performer I know says, "It's not about prizes." 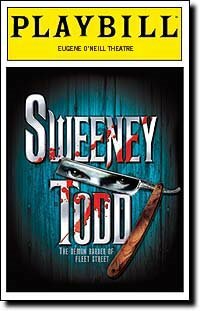 The cast of Sweeney Todd proved that it doesn't need a Tony Award to continue to perform at 100%. Despite not winning, it is the best reviewed show on Broadway this season and is considered a hit since it made back its investment early on in the run. The cast was on fire last night and the audience ate it up. The performance was relaxed yet fierce. At every opportunity, the audience let their presence be known with laughter, yells and extended applause. There were moments that I had not seen or noticed before - when Mrs. Lovett finished her work of cleaning up the blood, she looked at her blood-stained hands and just shrugged matter-of-factly. Noah said, "Patti is unreal." At the moment when Sweeney discovers that Mrs. Lovett has lied to him and she is pleading to him "But I love you", it was as if Patti LuPone was screaming it too her cast and too all of us. It was an incredible moment and continues to replay in my mind. The audience insisted that the cast stay longer than usual in their curtain call. At the stage door, there were a number of repeaters. Some were loud in expressing their dismay at the Tony results. A few of the cast responded by expressing their disappointment and shock, but were classy in not trashing the process. We told Donna Lynn Champlin that we bought our tickets months in advance in anticipation of being there for the first performance after the Tony awards and were thrilled to be there regardless of them not winning. She blessed us for helping them through the first performance after Tony Sunday and said, "We were saying to each other on stage that this was an incredible audience." Her sentiments were echoed by the other cast members. Patti said to me, "Hey I know you! Thanks for coming again." Noah and I told her that we would see her at Gypsy at Ravinia in August to which she replied, "Oh God, I'm so nervous about that, but I'll do my best". Why do I keep going back to Sweeney Todd? It's not just a Broadway show. It really is a theatrical event, a journey even. I love the music, the acting, and the staging, but I am drawn in by the horror, despair, hopelessness and conversely the humor, hope, and most of all the love. It makes me laugh and cry. A friend of mine suggested that I stop going when I reach # ____. No. I will stop going when I am no longer satisfied by the experience. If last night's performance was any indication, I don't see that happening anytime soon. I am seeing it Saturday night. YAY! I'm excited.